First, a big thank you and War Eagle to Riley for passing along the War Eagle Relics post to yours truly. He did an outstanding job sharing awesome pieces of Auburn memorabilia and the stories them. I hope to maintain the same standard of War Eagle Relic excellence he displayed “down through the years.” You can check out his previous posts here. Since we recently (and sadly) marked ten years since the untimely passing of Jim Fyffe, and since we’re approaching the 20th anniversary of the undefeated 1993 Auburn Tigers, I wanted to share some of my own relics from that perfect season. 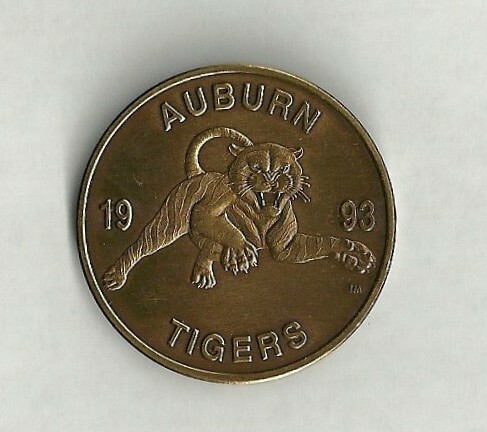 1993 coin: I’ve always loved the leaping Auburn Tiger logo. It seems like it was a mainstay on the set of the Auburn Football Review since the early days of Dye. Any Auburn item with the leaping tiger is first-rate to me. 1993 Ole Miss vs. Auburn student ticket: Terry Bowden’s debut. Many people forget this game was played on a Thursday night, originally scheduled for an ESPN broadcast. However, the NCAA sanctions and TV ban were announced just two-weeks prior to the game. Auburn was given the option to delay the TV ban for a year but chose not to, thereby setting the stage later on for the biggest game of Jim Fyffe’s career. 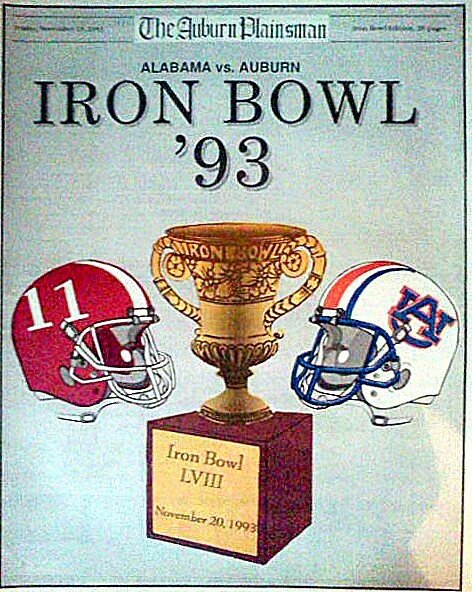 1993 Iron Bowl preview from the Auburn Plainsman: I love the fact the number eleven is on the Alabama helmet. I’m sure it was meant to represent the incorrect number of national championships they claimed at the time, but to me it signifies Alabama as Auburn’s 11th win of the season. ELEVEN AND 0! 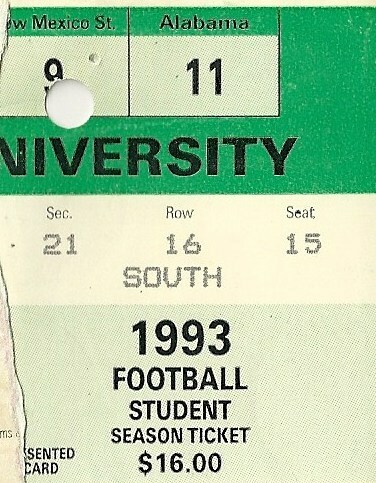 1993 Student season ticket: Instead of punching the Alabama game block, the ticket-taker ripped my student season pass in-two, tore it right down the middle and just about ruined a completely fine piece of Auburn ticket history. Needless to say, I was not pleased. Anyway, notice the price of the season ticket is $16, quite a bargain to see The Best Team on Radio. Last year student season tickets were $120. 22-14 Iron Bowl car tag: Not all Auburn faithful were able to see the ’93 Iron Bowl, but by the grace of Jim Fyffe they HEARD it. In his book Touchdown Auburn, Fyffe wrote that the ‘93 Alabama game was probably the biggest game he called as an announcer. No argument here. While home in Birmingham over the Christmas holidays that year, I placed this tag in the rear window of my car to remind everyone of the score. 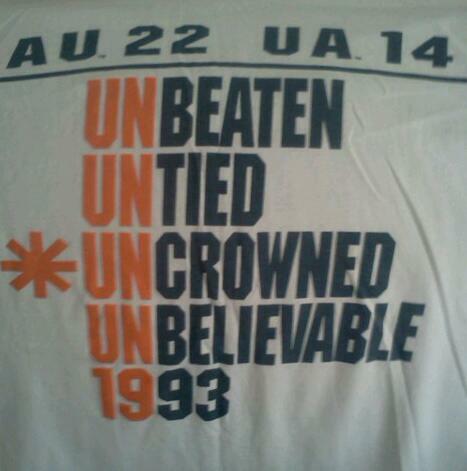 1993 Iron Bowl score shirt: This T-shirt is a bit worn and torn and has seen better days, but the message is still clear: Auburn may have not finished No. 1 that year, but they did finish No. UN. I really like the asterisk, makes it all the more charming. 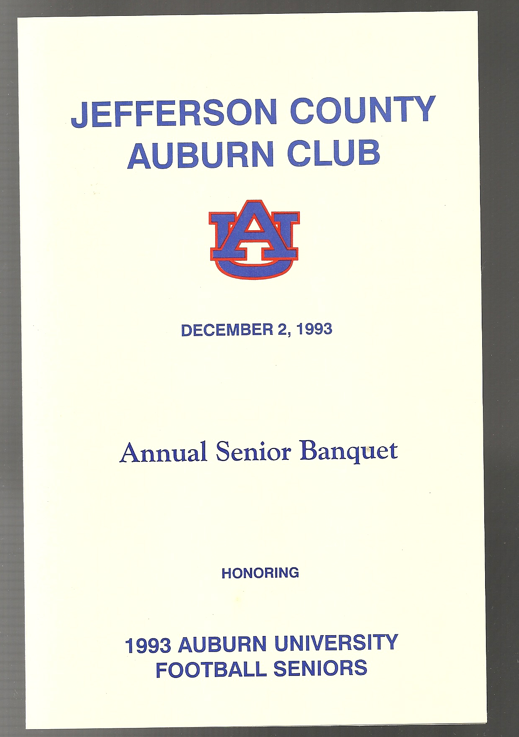 1993 Senior Banquet Program: The Jefferson County Auburn Club honored the senior class on December 2, 1993, the anniversary of Punt Bama Punt (1972) and First Time Ever (1989). I’m not sure if this was done on purpose or if that’s just how the date fell, but it sure seems like destiny to me. * Sexiest Auburn photo ever? Since we couldn’t watch the Iron Bowl on TV my dad and I decided to go deer hunting with a pocket radio. I almost fell out of the tree when Nix hit Sanders to get us back in the game. Eleven and OHHHHH!